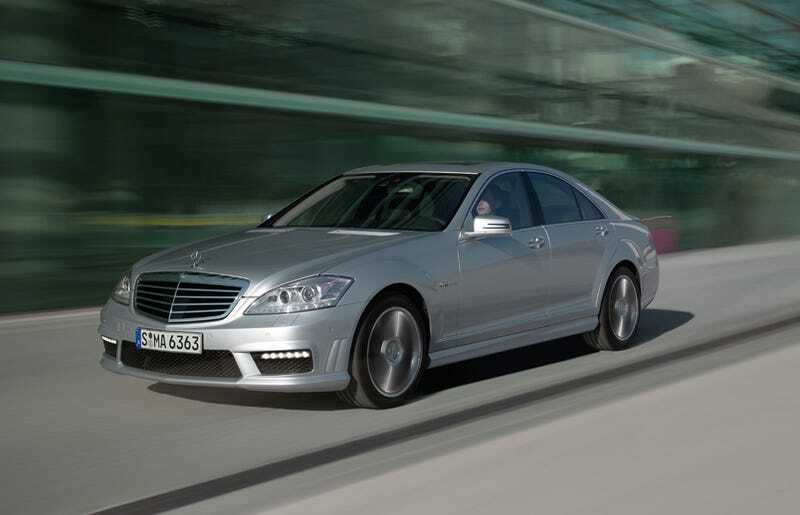 2010 Mercedes S63, S65 AMG: Super S-Class Gets More Power! As expected, the 2010 Mercedes S63 AMG and S65 AMG are launching with the same 6.3-liter V8 and 6.0-liter V12 as before, only now good for a bit more power — 525 HP and 612 HP, respectively. On the outside, the S-Class AMG's exactly what we'd expect — an S-Class with a head that's just a little bit more arrow-shaped and new LED taillights. But the only reason anyone buys the AMG is for what's under the hood. If the performance numbers sound familiar, it's because both the S63 and S65 have similar performance to the previous models but with lower emissions. The S63 gets a bump up from 518 HP to 525 horses and the S65 goes from 605 HP to 612. So, yeah, go environment! With the 6.3-liter normally-aspirated V8 you can shoot off the line and reach 62 MPH in a scant 4.6 seconds. WIth the biturbo V12, you can shave 0.2 seconds off that time. Look at it as the perfect paparazzi escape vehicle. Well, as long as the paparazzi have cars slower than the electronically-limited top speed of 15 MPH. top-of-the-line S-Class models, are now even more appealing: thanks to a series of subtle yet extremely effective fine-tuning measures, the two performance saloons are even more striking and priceless than ever before. The updated technology is aimed at ensuring a more dynamic driving experience as well as optimum active and passive safety. Exclusivity and dynamism, effortless superiority and high tech – both of the top-of-the-line S-Class models from Mercedes-AMG embody all of these characteristics. Since its market launch some three years ago, the S-Class made by AMGhas won the hearts of over 8000 customers around the world – turning it into the undisputed market leader in the small yet highly exclusive high-performance luxury saloon segment. Volker Mornhinweg, Chairman of Mercedes-AMGGmbH: "Our discerning clientele appreciate the synthesis of uncompromising performance and dynamic, exclusive equipment, a unique proposition in this market segment. We have raised the bar further in terms of driving dynamics, safety and passenger comfort with the extensively updated new series of the S 63 AMGand S 65 AMG." The S 63 AMG, with its powerful, high-revving 386-kW/525-hp AMG 6.3-litre V8 naturally aspirated engine developing 630 newton metres of torque, is capable of accelerating to a speed of 100 km/h in 4.6 seconds. The S 65 AMG, meanwhile, demonstrates even greater superiority: its AMG6.0-litre biturbo V12 engine delivers maximum power of 450 kW/612 hp and maximum torque of 1000 newton metres, accelerating from 0 to 100 km/h in just 4.4 seconds. Both AMG saloons are electronically limited to 250 km/h. Despite no changes having been made to the engine data and performance values, it has still been possible to reduce fuel consumption and CO2 emissions by up to 3 percent. Contributing to the even more exceptional status of the models is the new, more pronounced arrow-shaped radiator grille, featuring twin chromed louvres in the case of the S 65 AMG. The new front apron incorporates striking, AMG-specific LED daytime driving lights and two transverse air outlets on each side. Further striking features include the "6.3 AMG" or "V12 Biturbo" lettering on the front wings, and redesigned exterior mirrors. Side sill panels emphasise the elegant line of the front apron through to the rear of the vehicle, where the new rear apron features yet another highlight: the centre section of the black diffuser insert is now painted in the same colour as the vehicle body. New tail lights with 52 LEDs in the form of a double "C" also give the S-Class an unmistakable appearance from behind. A distinctive element of both models comes in the guise of the AMG sports exhaust with two chromed twin tailpipes, featuring a V12 design in the case of the S 65 AMG. Visual aspects which distinguish the V8 from the V12 model also include the attractive AMG light-alloy wheels: the S 63 AMG has 19-inch AMGmulti-spoke wheels painted titanium grey with a high-sheen finish and fitted with 255/40 (front) and 275/40 (rear) tyres. The S 65 AMG, on the other hand, comes with 20-inch AMG forged wheels painted titanium grey with a mirror finish and fitted with 255/35 (front) and 275/35 (rear) tyres. The AMG sports suspension based on Active Body Control (ABC) provides crosswind stabilisation as standard equipment for the first time: thanks to this function, influences caused by crosswinds are compensated for, or – in the case of strong gusts – reduced to a minimum. ABC compensates against the effect of crosswinds by adjusting the wheel load distribution within milliseconds, using the yaw-rate and lateral acceleration sensors of the Electronic Stability Program ESP®. inner rear wheel so that the saloon corners precisely and under control at all times. The Torque Vectoring Brake is an additional feature of the Electronic Stability Program ESP®and not only noticeably improves responsiveness but also active handling safety in critical conditions. The driving experience is further heightened thanks to the Direct-Steer system: with its variable ratio depending on steering angle, it helps to ensure a more direct response when cornering, and therefore more responsive handling – in brief: enhanced driving pleasure at the wheel of the Mercedes-AMG S-Class. Based on the ADAPTIVE BRAKE system, the AMGhigh-performance braking system continues to provide optimum fade resistance, deceleration and sensitivity. The front axle features a double floating brake caliper. This exclusive technology combines the advantages of a sliding-caliper disc brake – reduced heat transfer to the brake fluid and clear advantages in terms of comfort thanks to the brake lining guide mechanism – with the efficiency of an extra large fixed caliper brake. The interior appointments are every bit as exclusive as the high-tech package: as soon as its door is opened, the S 65 AMG welcomes the driver with large, animated "AMG V12 BITURBO" lettering in the instrument cluster's central display. The AMG main menu provides the driver with information about engine oil temperature, current gear range and the battery voltage. In the case of the S 63 AMG, the extensive range of standard equipment includes not only PASSION leather appointments, with natural leather in the seat side bolsters, but also front AMG sports seats with climate control, massage, multicontour and dynamic handling function. The Exclusive PASSION leather upholstery in the S 65 AMG, meanwhile, with its AMG V12 diamond pattern design, exudes an air of even greater refinement. Ample use of trim elements and the AMG-specific analogue clock, featuring an IWC design, are a given in both AMG models. Both the AMGSPEEDSHIFT 7G-TRONIC of the S 63 AMG, as well as the five-speed automatic AMG SPEEDSHIFT transmission of the S 65 AMG, are fitted with DIRECT SELECT gearshift. Gear changes are carried out by means of AMG aluminium shift paddles on the new AMG sports steering wheel. In addition, both of the top-of-the-line AMGmodels set new standards when it comes to active and passive safety through an unrivalled combination of innovative camera and radar-based driver assistance systems. These include the ATTENTION ASSIST drowsiness detection system, Adaptive Highbeam Assist, Lane Keeping Assist, and the PRE-SAFE®Brakes, which are linked to the proximity regulating radar and intervene independently in the event of an impending accident to act like an invisible crumple zone. Night View Assist with infrared camera also features a novel pedestrian detection system. The pictures from the windscreen camera are also used by the new Speed Limit Assist, available as an option. The Brake Assist PLUS and DISTRONIC PLUS proximity control support the driver in the event of emergency braking. The PRE-SAFE®positioning function and NECK-PRO luxury head restraints in the front are now also included as standard. New infotainment systems, including COMAND APSwith new SPLITVIEW display, which shows different images for driver and front passenger simultaneously, enhance occupant comfort even further.